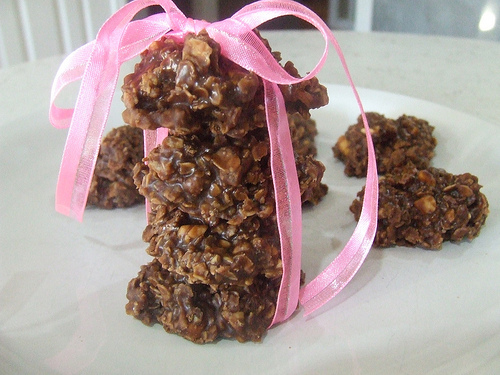 These little nuggets are a great go to for a cookie swap or a quick snack. Wrap them up with a nice bow, and you've got a tasty treat to add to a gift basket. *other optional add-ins: raisins, salted peanuts, M&Ms, Sixlets candies. 1. Put the chocolate chips and peanut butter in a microwave safe bowl and microwave for 1 1/2 minutes (in 30 second intervals), stir to melt the chocolate and peanut butter. 2. Add in the cornflakes and, if using, the cranberries. Stir to mix well with the chocolate. 3. Scoop with a cookie scoop and drop on a parchment paper lined cookie sheet. Refrigerate until harden, about 10-15 minutes. 4. Store in a air-tight container at room temp, if they are for you to eat...if you plan to package them up and give away- I would suggest refrigerating them till you do so.